Situated on a beach, the Palais Des Roses Resort & Spa is a luxurious resort. It offers numerous guestrooms to suit the needs of solo travellers, couples, families and group of friends. The resort houses a state of the art gym as well as a beautiful spa that offers a wide range of massages to help you relax and rejuvenate. There’s also a lovely swimming pool where you can take a relaxing swim in the balmy Moroccan weather. You can also explore the resort’s private beach area. The 405 guestrooms offer excellent views of the sun, sand and sea. The resort is perfect if you wish to conduct conferences, business meetings, social events and weddings. 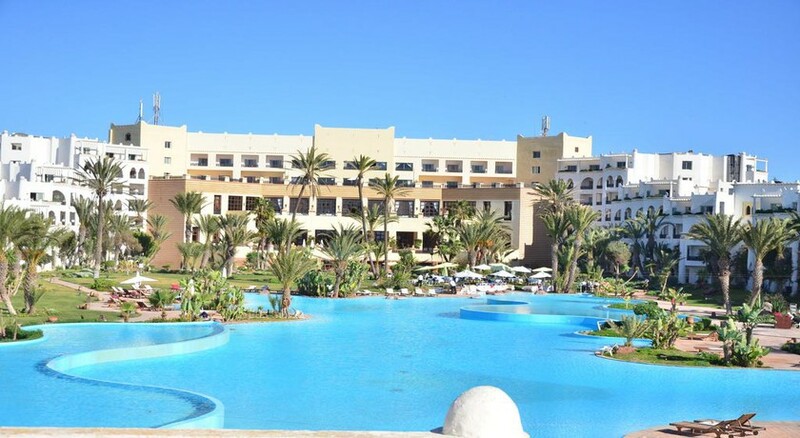 Nestled right opposite to a golden sand beach, Palais Des Roses Resort & Spa enjoys a fabulous location. It is within close proximity to numerous shopping malls, places of interest and water parks. The resort’s private beach area is hardly a few metres. 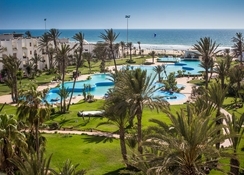 Agadir Al Massira Airport is about 23km from the resort. The Palais Des Roses Resort & Spa offers luxurious guestrooms, suites and apartments to its guests. The rooms are categorised as standard room, pool view room, junior suite sea view, senior suite sea view, family apartment, connecting rooms, room sea view and royal suite panoramic sea view. All the rooms are meticulously decorated and comprise the following amenities: satellite TV, phone, mini bar, safe, double bed, shower room, bathroom with shower and bathtub, hair dryer and much more. There restaurants and bars in the resort offer local as well as continental cuisines. The onsite restaurants and bars include Jazz Bar, Le Safran, L’Oasis and The Mediterranean. The Jazz Bar overlooks the pool and offers a wide range of juices, tea and coffee. Le Safran serves true Moroccan cuisine complemented by mint tea. L’Oasis, overlooking the sea, offers some excellent pizza. Mediteranée Restaurant, true to its name offers Mediterranean cuisine. Palais Des Roses Resort & Spa has an astounding variety of sports, relaxation and recreation facilities, which will surely keep guests engaged on their holiday. Guests can bask in the sun on the beach or dive into the lovely swimming pool. Other facilities include a fully-fledged fitness centre, spa, tennis court, private beach, treatment cabins with underwater view, petanque, beach volley ball and many more games. Children too can have a lot of fun in the Children’s club under the supervision of the resort’s staff members. I stayed for five days over Christmas 2017, from the moment you arrive, the hotel staff look after you. Consierge take your bags, or in my case a small rucksack (made me smile) to your room, he then gives you a tour round your spacious room. Plenty of choices for breakfast and a nice young lady cooking omelets and morrocan pancakes. 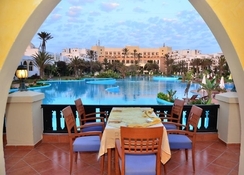 The hotel boasts the biggest swimming pool in Agadir, which is well set in the beautiful gardens. The spa is very good and the staff cannot do enough for you. 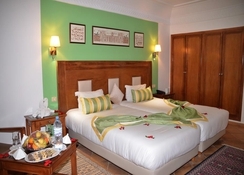 The hotel is located about a thirty minute walk from the center of Agadir and forty five minutes from the marina. The hotel is alcohol free, so if you need a night cap, buy a bottle of duty free on the way out, as alcohol is heavily taxed in Morocco. The hotel was absolutely mesmerising with a brilliant l beachside view. The service was second to none- really enjoyed myself ! A lovely hotel and we would definitely go back. It was a little noisy at night and the noise was mainly in the foyer with the children, but it didn't spoil it too much. It isn't for everyone but we loved it and enjoyed the different cultures.